"During my first two week visit, I met with Jetsun Lochen for several hours a day, sometimes in the company of her main disciples. She was an extraordinary woman, small in stature, with a serene face radiating compassion and sensitivity. Only her white hair betrayed her age... In her presence we felt an awesome power that permeated our whole stream of being... Her teachings and blessings have given me inner strength and inspiration ever since. 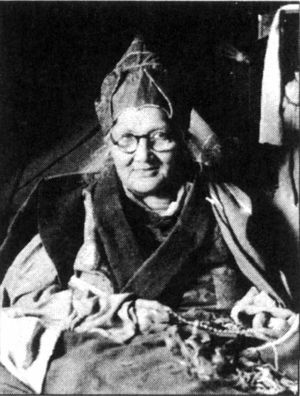 To me she was the personification of the great woman teachers of Tibet." Chönyi Zangmo was born in Mandi, the birthplace of Mandarava near the banks of Tso Pema in Northern India. Her main teachers were Pema Gyatso, who was a student of the great Shabkar, and Chönyön Dharma Senge. She also received transmissions from Trulshik Dongak Lingpa. She gave the empowerments of Nyingtik Yabshyi to Trulshik Rinpoche. Jamyang Khyentse Chökyi Lodrö composed a guru yoga focused on Lochen at the request of her disciple Ngawang Chönyi. Nyoshul Khenpo, A Marvelous Garland of Rare Gems: Biographies of Masters of Awareness in the Dzogchen Lineage (Junction City: Padma Publications, 2005), pages 343-350. This page was last edited on 26 November 2017, at 18:10.